Cornell School District eighth-grader Jada Jenkins stood in her conventional classroom and journeyed to another world. Thanks to a virtual reality headset placed over her eyes, the desks and chairs disappeared from sight. Instead, she was surrounded by a three-dimensional deciduous forest that was decidedly different from the ordinary environment of her Western Pennsylvania school. The illustrated forest — with geometric-shaped trees, other plants and animals — beckoned Jada and the other eighth-graders to an adventure. “Oh, cool!” exclaimed Jada, who was given her own avatar in the forest. She looked for her classmates, motioning with the controller in her hand to make her avatar move. “I’m waving at you. Turn around,” she called to a friend. Then she got to work. Jada and the other students were each assigned a team to solve clues in a scavenger hunt. Which omnivorous animal would forage for nearby plants and animals upon awakening from a very long nap? Students who solved the puzzle by finding a black bear could plant a team flag to show success. As they worked, their earphones provided a forest ambience: water rippling in a lake, or a reverberating echo in a cave. Jada said she learned facts about wolves and monarch butterflies in the hunt. 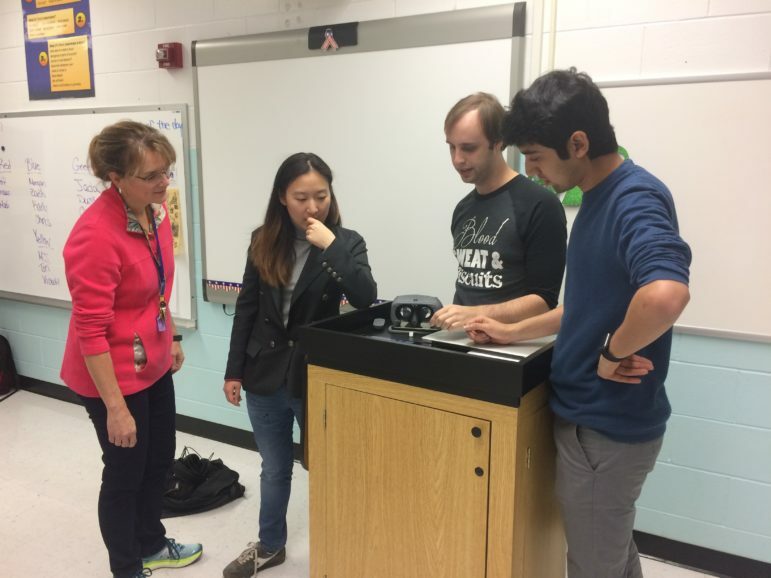 “When you’re doing cool new technology, you want to try it and learn it all,” she said. 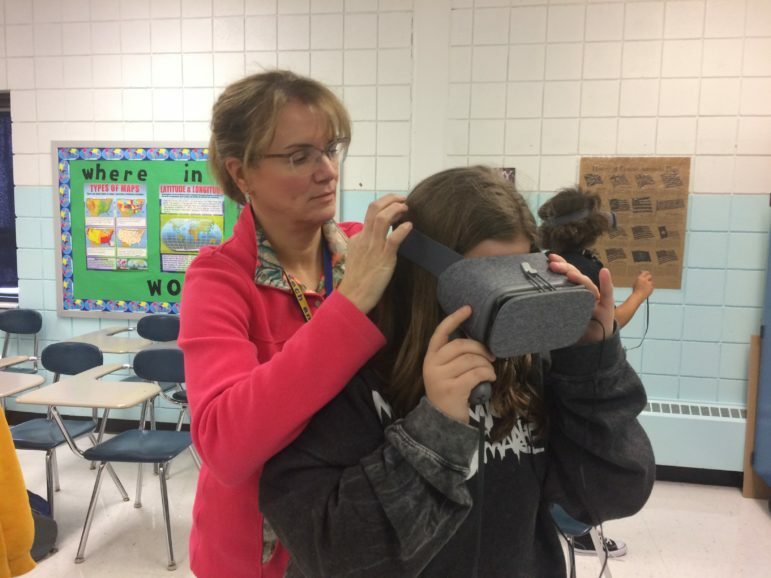 Cornell School District science teacher Susan Dunning helps eighth-grader Madison Litzinger adjust the virtual reality headset. (Photo by Eleanor Chute/The Hechinger Report)Virtual reality (VR) is emerging as a way to provide deeper learning in K-12 schools. When students are virtually immersed in material, they experience it in ways that can’t be conveyed by a picture in a book or line of text, VR proponents say. “Virtual reality allows students to explore places and structures in a way that is as close to real life as possible, without actually leaving our campus,” said Kristopher Hupp, director of technology and instructional innovation in the small Cornell School District, located about 10 miles west of downtown Pittsburgh. By donning virtual reality headsets, Cornell students have immersed themselves in three-dimensional scenes of a Syrian refugee camp, the Great Wall of China and ancient Rome. Some watched the presidential inauguration on live 360-degree video, which allowed them to see not only the spectators in front of them, but also around them. These students are at the vanguard of using VR as a learning tool, experts say. Although virtual reality headsets are common in game arcades and electronics stores, they are still unusual in classrooms. While virtual reality is an immersive experience, other virtual experiences — like augmented and mixed reality — superimpose virtual content on the real environment, such as a virtual volcano erupting on a real desk. Both augmented and mixed reality are in earlier stages of development than virtual reality, but down the road they may become useful for helping students visualize places, objects and abstract ideas. Schell, whose company is developing a virtual chemistry lab, sees parallels between the early days of computers and virtual reality now. When computers were first introduced in the classroom, some educators complained that they were too expensive, no one else was using them or there wasn’t enough software. Concerns about the new technology go beyond high cost and available content. Some equipment requires students to be tethered to a device. Students wearing headsets can’t see each other or even the classroom and often can’t interact with classmates. Some students feel dizzy or nauseous using the headsets. “There’s a ton of challenges,” Cornell’s tech leader Hupp acknowledges. 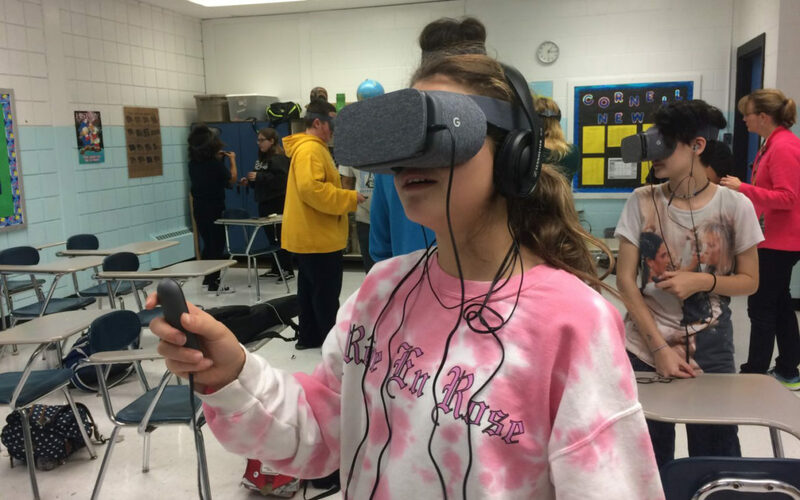 Although the high-poverty Cornell School District has only about 630 students, it was able to take the plunge into virtual reality with a $20,000 foundation-funded grant provided through the Allegheny Intermediate Unit, a regional public school service agency. With the grant, the district bought 15 Google Daydream headsets for older students, 15 Mattel View Master virtual reality viewers for younger students and 15 Google Pixel smartphones. The virtual reality apps are installed on the smartphones, which then fit into the headsets. Teachers, who don’t wear headsets, use already-available iPads to monitor and direct the experience. The district also bought two 360-degree still cameras so teachers can develop their own content. Other Western Pennsylvania districts are also experimenting. Tyler Samstag, director of instructional innovation at the Allegheny Intermediate Unit, has trained about 150 teachers in virtual and augmented reality. The AIU is also adding virtual reality equipment to its lending library for educators. Word that Cornell owned virtual reality equipment spread to the Carnegie Mellon University Entertainment Technology Center where graduate students were developing Voyage, a virtual field trip. The district and CMU entered into a partnership in which Cornell students gave input as the grad students designed their project. Unlike many VR experiences, in which students are isolated, Voyage allows students to collaborate in VR. Seventh-graders, along with science teacher Susan Dunning and geography teacher Megan Fuga, repeatedly gave the CMU students feedback on what worked and what didn’t. The final feedback came from eighth-graders, trying the game for their first time. Immersed in the forest, students still had to read clues about plants and animals to complete the scavenger hunt. Ms. Dunning followed up with a traditional class discussion in which students were eager to share what they learned. Even so, Erwin doesn’t see virtual reality as an everyday classroom experience but rather an occasional one. This story was produced by The Hechinger Report, a nonprofit, independent news organization focused on inequality and innovation in education. Sign up for The Hechinger Report's newsletter here.